Easter is coming up next month, and Yoshi is out to celebrate the holiday early with his latest platforming romp Yoshi's New Island. This Nintendo 3DS game is one Nintendo hopes will tide 3DS platforming fans over until Kirby Triple Deluxe comes out on May 2. Here is our review. Yoshi has sort of been like the black sheep-- er, dinosaur-- of Nintendo's 2D platformer line. He started out in his solo career with the marvelous Super Mario World 2: Yoshi's Island on the Super Nintendo. Since then, he's dabbled in Yoshi's Story, a passable platformer for the Nintendo 64, he's been a part of a failed tilting experiment in Yoshi's Topsy Turvy for the Game Boy Advance, and he's tried to regain his SNES fame with Yoshi's Island DS. All of these titles hold no candle to Yoshi's first solo outing. Arzest is attempting to try again, this time with a game that more closely follows the foundation that the original Yoshi's Island laid, like Yoshi would an egg. The end result is Yoshi's New Island for the Nintendo 3DS. It all sounds eggs-citing, but does Yoshi's New Island live up to its SNES pred-egg-scessor? In a move that totally retcons the original Yoshi's Island, it seems that the house that the stork dropped Baby Mario and Baby Luigi off at was the wrong one. In a frantic attempt to salvage this disaster, the stork swiftly flies into the sky, furiously searching for the right home. However, Kamek comes into the picture, has a tussle with the stork, and escapes with Baby Luigi in his clutches. Meanwhile, Baby Mario falls into a circle of Yoshis who decide to help the soon-to-be hero search and find his once again missing brother. Baby Mario drops in on a Yoshi gathering. 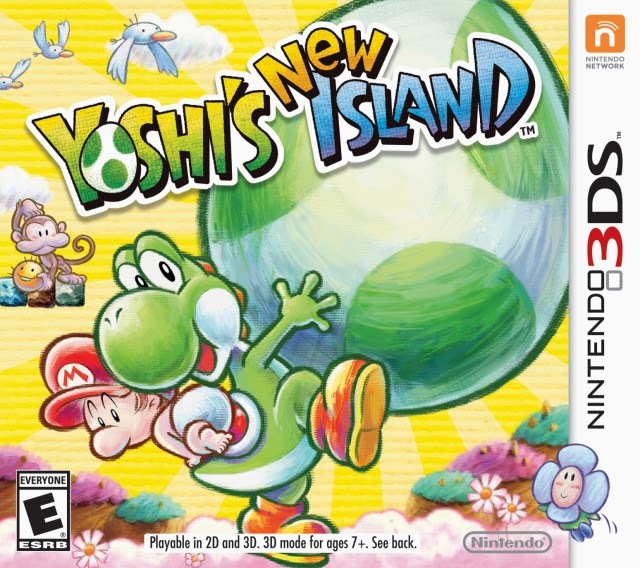 The "new" in Yoshi's New Island really doesn't refer to changes in the gameplay or structure of the game. It's more to do with the new locale the game presents players. I mean, you're still one of eight differently colored Yoshis, you're still jumping, flutter-jumping to score extra distance, lashing out Yoshi's tongue to eat and create eggs, tossing said eggs at set angles determined by well executed timing, and running through six worlds of eight levels each. Eggs can also nab collectibles. The only really new elements that Yoshi's New Island brings to the table are two different eggs types. The Eggdozer is a gigantic egg that can crash through usually indestructible objects and walls, while the Metal Eggdozers allow Yoshi to sink down into watery depths, where normal Yoshis only dream about going. (They can only float on the surface of the water usually.) This opens up some neat puzzles and gives Yoshi a unique feel. However, these two new egg offerings seem too safe of additions to the series, and they come across more like something to add bullet points to the game. 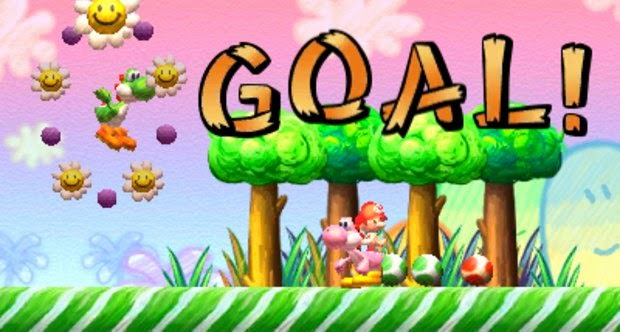 If your only goal in Yoshi's New Island is to rush through the levels and reach the ending of the game, you'll burn through this 3DS installment within 3-4 hours. That is, you'll pretty much find the game over-easy (*cough*). You'll also be missing the important factor that makes Yoshi's New Island and the Yoshi's Island series in general challenging. 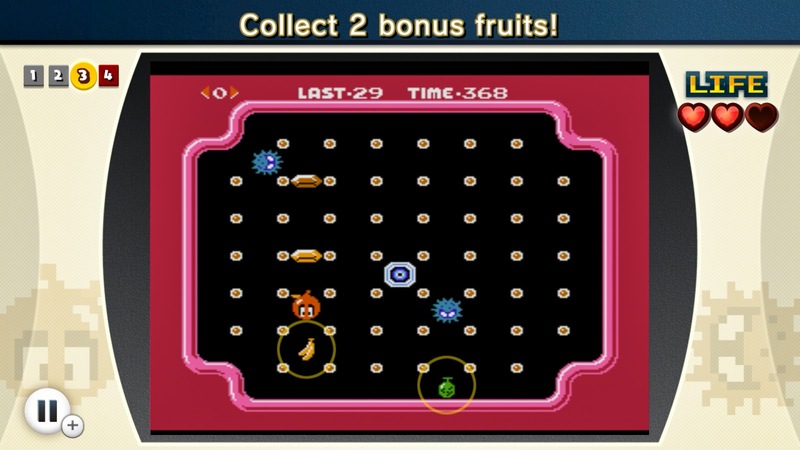 Each level has three collectibles to nab: twenty red coins, five red flowers, and thirty stars. This Yoshi has an eggs-quisite arsenal. The stars are the most necessary to collect. Each time Yoshi is damaged, Baby Mario gets separated from him, slowly rising and falling inside a bubble. A counter slowly ticks down, each representing a star you have collected in the level, up to thirty. If the countdown reaches zero, Baby Mario is grabbed by Kamek's henchmen and you lose a life. What challenge there is in Yoshi's New Island comes from getting 100% completion on each and every level. This means getting all of the red coins, flowers, and stars. The latter essentially requires you to remain untouched in the whole level. No damage and no deaths, as unlike past Yoshi's Island games, when you restart from a checkpoint you do not have the same tally of stars you died with. Instead, you get dropped down to the standard ten stars. Yoshi's looking to replace this foe's filling. Also unlike past Yoshi's Island games, you get a bit of a reprieve with going for 100% complete in each level. In Super Mario World 2 and Yoshi's Island DS, you had to acquire all of the three collectibles in one run. In Yoshi's New Island, you can collect all of one collectible, and then try the stage again, this time aiming to get all of another type of collectible. While this makes the game sound easy-peasy, it's a welcome feature, especially for the unlockable bonus stages, earned by getting 100% completion in all of a given world's levels. These bonus stages have nothing in the way of checkpoints, and they are some of the most difficult levels seen in a Yoshi-related game. "Poochy Ain't Stupid", but 4-S disagrees. The new rules of how 100% completion works also helps because there are multiple areas to each level, many of which you are unable to return to once you pass through them. This makes it so if you accidentally or unbeknownst to you forgot to collect a red coin but have all five flowers and all thirty stars, you need not collect the flowers and stars again. Instead, you can just focus on collecting the red coins. With my save file I managed to finally get 100% completion on every level in the game in about twenty hours give or take an hour. Unfortunately, there's no reward for doing so other than personal satisfaction (and to rub it to other players on Miiverse). not to touch those scalding Chomps. Like Super Mario World 2, Yoshi's New Island consists of six worlds, each with nine levels apiece-- one of which is unlockable. The level design itself walks a fine line between interesting and pedestrian, sometimes offering clever platform and enemy placement, as well as smart level gimmicks. One of my biggest issues with the level design, however, is in the way an alarming amount of secrets are hidden. They are oftentimes placed in invisible clouds that only appear if Yoshi or an egg passes through them. 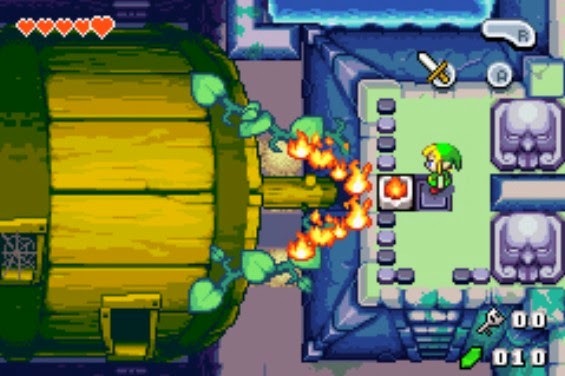 When these clouds are burst open by an egg, they can reveal a series of coins, some of which are of the red variety, that a player could easily miss out on. There's also certain platform combinations that secret goodies hide in as well. Leaping from one platform to another reveals a reward. While it doesn't seem random at all, it makes exploring the levels a little arduous and exhausting sometimes as you scour every nook and cranny for invisible bounties. Yoshi's New Island also contains vehicle segments. However, these are self-contained areas that must be entered through a special door in the levels they appear in. Yoshi can transform into a mine cart, a bobsleigh, a jackhammer, a helicopter, a submarine, and a hot air balloon. Unfortunately, the developers decided to use the gyro sensor of the Nintendo 3DS hardware to shoehorn in very much unneeded tilt controls for all of these transformations. Most work okay, but transformations like the submarine and helicopter are a bit unwieldy. These required me to tilt the 3DS at crazy angles, and I'd still have problems. That said, even if you fail to reach the exit of each vehicle section (you're timed), you get put back at the door that is the entrance to the vehicle segment. You can simply try and try again until you complete it. transformations Yoshi can shift to. 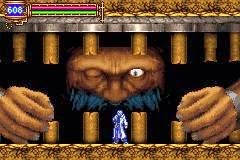 Each fourth and eighth level of each world features a boss battle at its conclusion. For the fourth level, Kamek is always Yoshi's opponent, using different means to damage him and Kamek using different means to take out Yoshi. The eighth level bosses have more character, using Kamek's tried and true method of enlarging an ordinary enemy to gigantic proportions. Some of these battles are better than others, and some are just boring and bland. boss won't drive Yoshi batty. What certainly isn't boring and bland are the visuals. Screens and videos on YouTube really don't do Yoshi's New Island's look any justice. You truly have to see the game on the 3DS or 3DS XL's screen to fully appreciate it. The most incredible part of the art design is the beautiful animated backgrounds. It feels like you're playing inside a children's picture book. The depth portrayed by the stereoscopic 3D effect makes the game pop out look marvelous. Unfortunately, the sound design doesn't come out as well. I hope you like the main theme of Yoshi's New Island, because you're going to hear about 40 remixes of it. Maybe I'm exaggerating a bit, but that's what it felt like. There's a jazz version, there's a jungle version, there's an electronic version, and there's even a kazoo version that the sound team must have been drunk when they said such a version was acceptable. It's sensationally grating to the ears. but keep your wits about you! It's hard to say that it's bad that Yoshi's New Island doesn't do much that could realistic be called new, because we've only had three games like this since 1995. The formula really hasn't yet overstayed its welcome yet. I'm perfectly okay with this 3DS entry staying relatively true to the Super Nintendo original because of this. However, I'd love to see Nintendo take over the reins of this franchise, as its homegrown developers could give Yoshi an unforgettable Yoshi's Island game that the current developer Arzest cannot. Still, if you're looking for a tried, true, and safe addition to the Yoshi's Island name, Yoshi's New Island might not be eggs-traordinary, but it is rather eggs-cellent. ...I'm very sorry for the forced eggs puns. The Game Boy Advance released thirteen years ago today in Japan. Conveniently enough, Nintendo plans on launching the Virtual Console service for Game Boy Advance games on the Wii U next month. What better opportunity than to discuss some of the games that strike our fancy-- ones we're just dying to (re)play. Once you've seen our choices, feel free to list which GBA games you're most looking forward to seeing put on the Virtual Console. We begin our list of Game Boy Advance Virtual Console desires with one of Nintendo's most popular franchises, The Legend of Zelda. 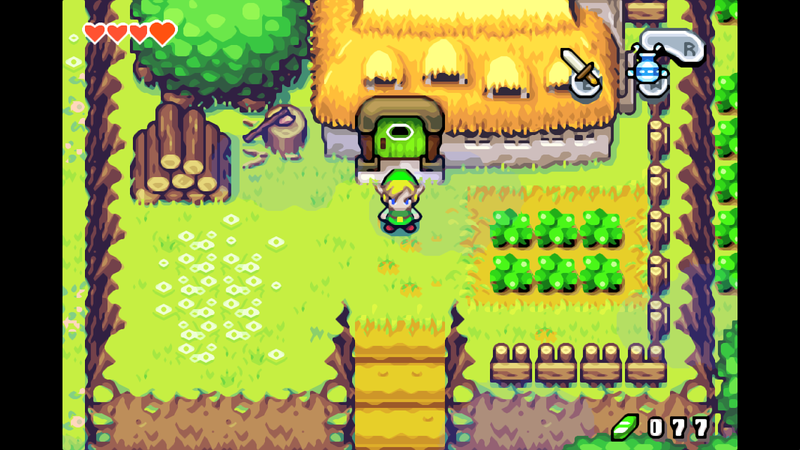 While the GBA received two Zelda titles, The Minish Cap (the second release) was the only wholly original entry, as the other was a port of the Super Nintendo's A Link to the Past. Offering the ability to shrink down to Minish size to get a glimpse of the world through that race's eyes and teensy perspective. The Minish Cap brought with it a wide variety of areas to explore, clever and crafty dungeons to take on, Kinstones to fuse, and a cast of characters that were both charming and memorable. 3DS Ambassadors already have this game at their fingertips, but it'd be nice for others to get their mitts on this title. Seeing as a loose cartridge version of the game goes for a fairly high price, the more people can play The Minish Cap, the better. 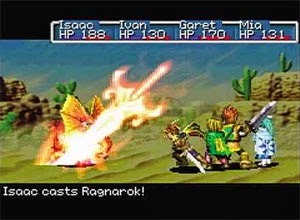 Confirmed for the Japanese GBA Virtual Console launch, Golden Sun is one of our favorite RPGs of all time. Its ability to seamlessly intertwine dungeon exploration with puzzles that need to be solved using magic (or as the game refers to it as Psynergy) made it a blast to journey through Weyard. Finding and collecting Djinn, magical creatures that boosted stats for characters and were used for summoning in battle, was a great pleasure. 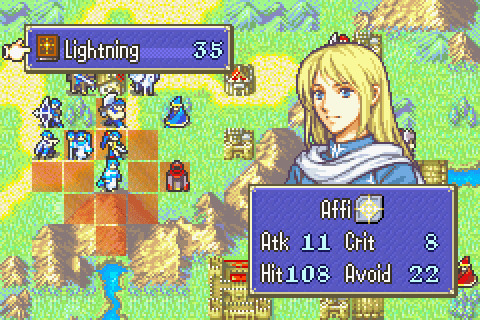 The combat system required strategy, even on easy fights. 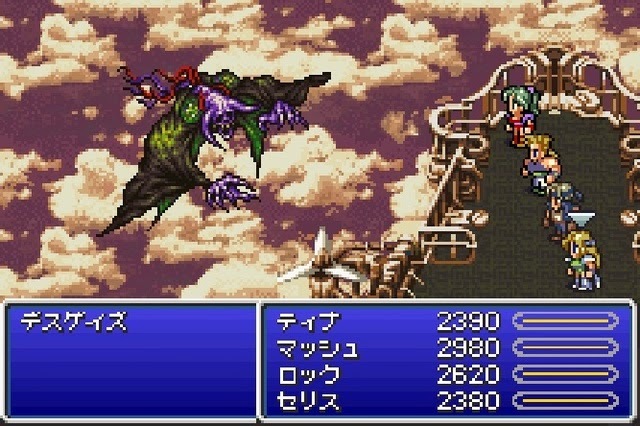 If an enemy was defeated and another party member was going to attack it, that member forfeits their turn. 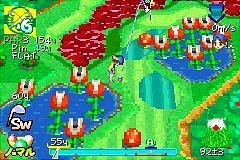 Golden Sun remains the best of the series, and we can only hope the game makes it to the North American GBA VC launch. Not only were these two titles the introduction of the franchise to many gamers, aside from those who already met Roy and Marth in Super Smash Bros. Melee, but Fire Emblem and its sequel are both expensive titles to get one's hands on. The ease of allowing people to enjoy them in a legal manner makes total sense to us. Plus, it'd get even more folks into this phenomenal strategy RPG franchise. 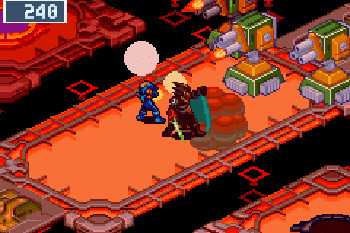 A remake of the now antiquated original Metroid, the Game Boy Advance's Metroid: Zero Mission is our favorite of the two Game Boy Advance Metroid games. Not only did the remake offer more distinguishable areas to explore, more items to upgrade to, a super-helpful map that was sorely missing in the NES original, updated music, and an entirely new endgame section featuring Samus without her armor. 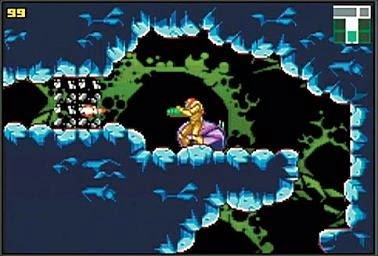 There's a lot of classics in the Game Boy Advance's library, and Metroid: Zero Mission is one that stands near the top of the heap. 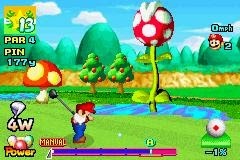 What better way to gear up for the Nintendo 3DS' Mario Golf: World Tour releasing in May than with the Game Boy Advance entry of the series? Bringing with it highly detailed golf courses, a charming cast of characters, and the return of the RPG-like Career mode all created a fantastical golfing experience that we're sure many would love to return to or experience for the first time. 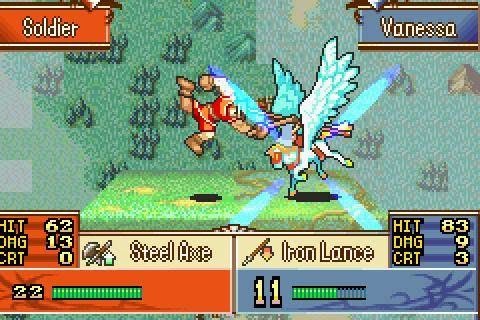 There are few games on the Game Boy Advance that we can say that we've poured the most hours into. As a sum, the six Mega Man Battle Network entries (not counting titles with two versions) gave us over 300 hours of play time total. Journeying around the world as Lan, Mega Man.EXE's operator, and then jacking into the net to bust viruses large and small in cyberspace, and see Robot Masters from the classic Mega Man series represented with new designs to challenge Mega Man all made for a fun time. The chip-based combat relied heavily on improvisation and working with what you have. The enjoyment of deleting a series of enemies in record time and being given a rare chip for your efforts made combat rewarding. 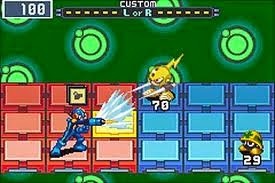 If anything, we'd love to see the original Mega Man Battle Network launched on the Virtual Console, as that game is worth a fair amount of change even in cartridge-only form. "Sonic hasn't been good since the Genesis." How many times have you seen this argument? Sure, one can ignore Sonic Colors, Generations, and the handheld line of games to fit their argument, but it just makes them look silly. 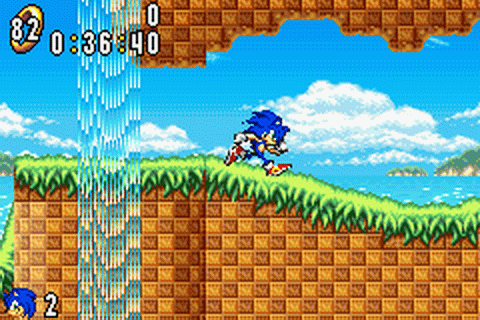 The Sonic Advance trilogy showed impressive design, especially for Dimps, who nowadays isn't exactly known for high quality games. 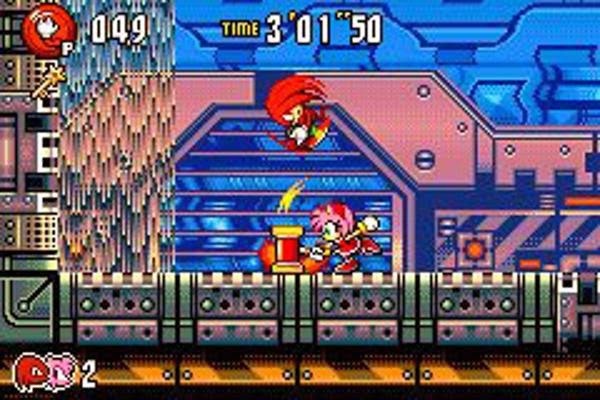 The addition of four playable characters, each with their own special abilities, made the longevity of the games longer without feeling like much in the way of padding. It still feels odd to our 8-year-old selves that Sonic the Hedgehog is on a Nintendo system, and not every game has been great, but the Sonic Advance series is one that truly is. 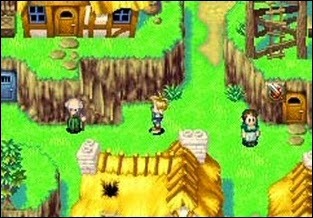 While Final Fantasy III was released on the original Wii Virtual Console service, its Game Boy Advance counterpart offered much more content, bonuses, and changes/improvements. 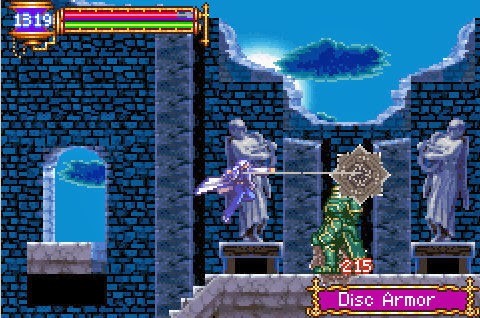 Such changes and improvements included an all-new translation that followed more closely to the Japanese original, several bugs have been fixed from the SNES original, a duo of new locations were added, plus a bestiary and music player were present. 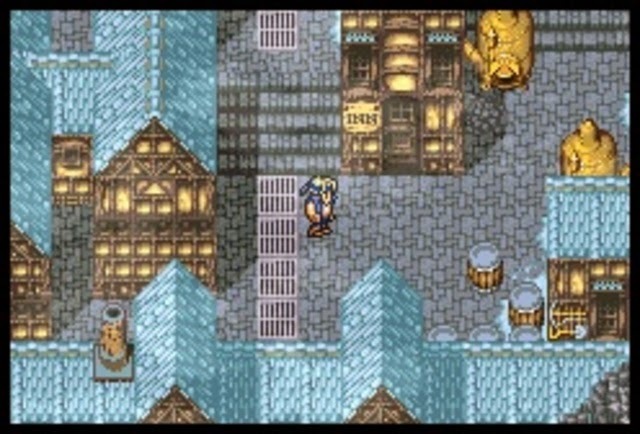 It makes much more sense to release the fully featured version of Final Fantasy VI than simply the SNES original. Of course, Nintendo really doesn't do things that make sense all the time. Here's a pick of a game that maybe some of you have never heard of. It's Hudson's Ninja Five-O. 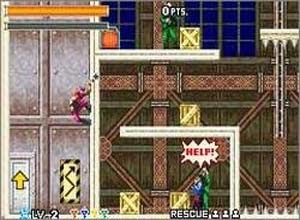 It was a title that was very similar to something like SEGA's Shinobi series. The challenge was rather steep, but the difficulty was always fair. 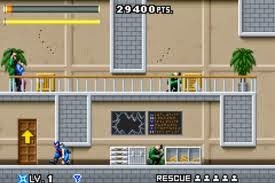 Ninja Five-O received great reviews, but it had very much lukewarm sales. It would be lovely to see Ninja Five-O get the attention it deserves, and Nintendo's Virtual Console service is just the platform to do that. 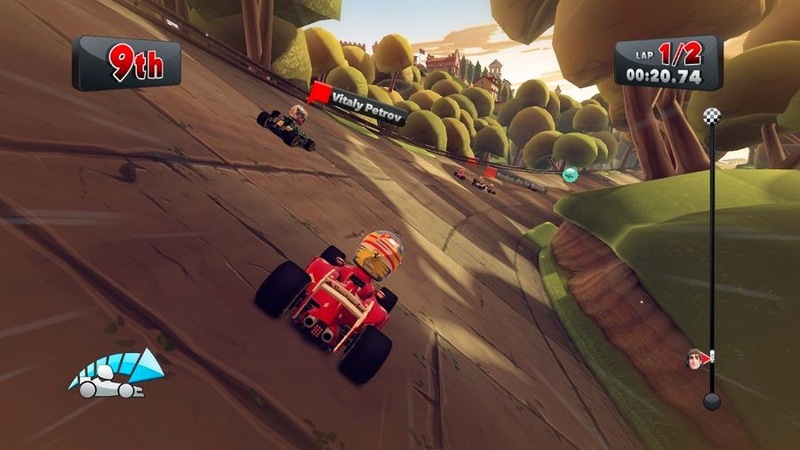 F1 Race Stars is a game that excited me when I saw the first screens and gameplay footage of it. I said to myself, "Phil, this game is obviously for you. 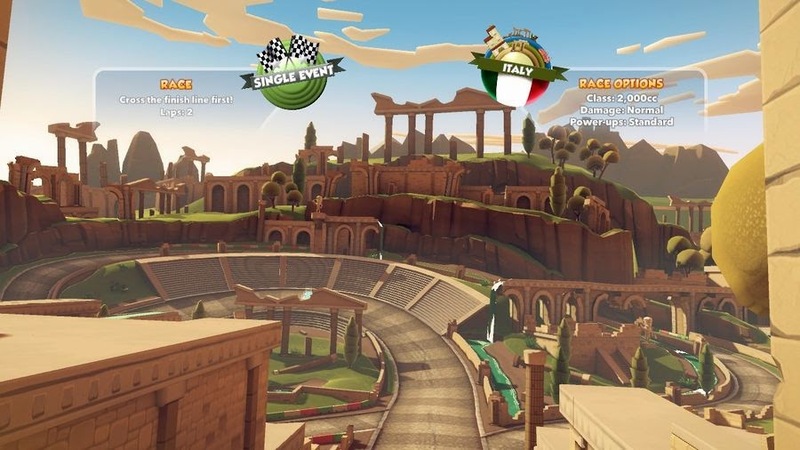 It's cute, it's charming, the track design looks great, and it reminds you heavily of Mario Kart." I finally was able to try out the game on the Wii U with F1 Race Stars: Powered Up Edition. Disappointment would be an understatement towards my feelings of this game. Here's my review. 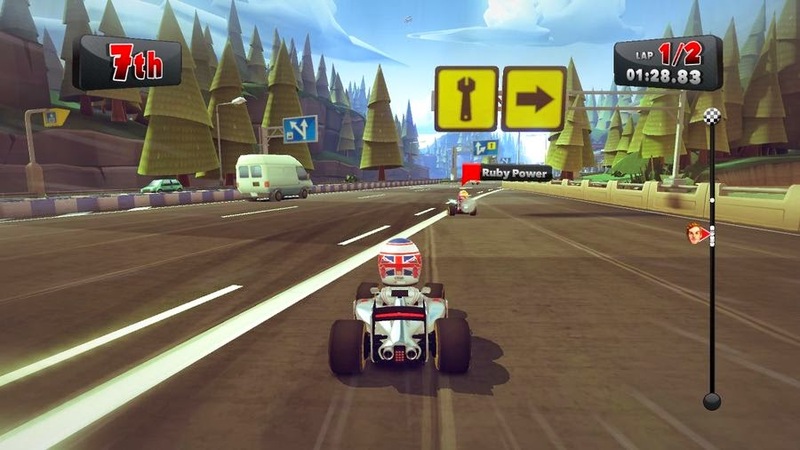 F1 Race Stars originally released on the PlayStation 3, Xbox 360, and PC in retail form way back at the end of 2012. Fast forward to the present and the game has found its way to the Wii U, albeit in simply a digital format. "Powered Up Edition" might be the Wii U version's subtitle, but there is nothing at all powered up about this version. In fact, it's more like "Powered Down", as online multiplayer has been completely taken away. 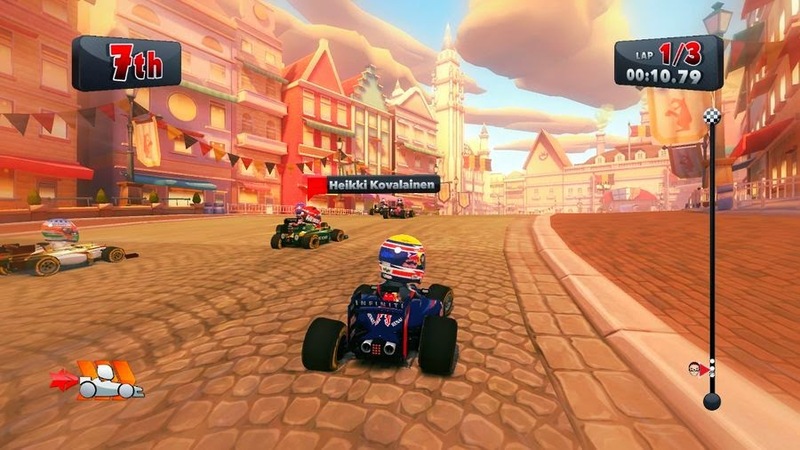 That's not the worst of F1 Race Stars: Powered Up Edition's problems, however. Like being at the top of a hill, things simply go downhill from here. Right away when you start F1 Race Stars you will be welcomed by an insanely cute exterior. Real F1 race car drivers appear in cartoon form, and at the start of each race they pop their heads out of their karts like jack-in-the-boxes, point their fingers at one another in succession, wink at each other, and put their racing helmets on in a variety of wacky ways. The track design is pretty nice, each of the fifteen being based off of a particular country. Of course, stereotypes and generalizations are used liberally to associate obstacles and environments with their given country, but each track has its own distinct flair that distinguishes it from others. China has you driving atop its Great Wall, Italy has you racing through Coliseum-like ruins, and Germany has you speeding through the twists and turns of a castle. and many are even fun to race on. F1 Race Stars uses the Formula One license is some neat ways. For instance, like Formula One vehicles, there is no drifting to be found. Instead, you must carefully and skillfully take corners, applying the brake when necessary. It's finding the most adequate racing line that will prove advantageous in races. There's also slipstreaming, a popular element of racing. The KERS function is used on certain turns where there is a blue and white striped pattern on the track. In these sections, all you need to do is stay in the zone, and alternate between pressing and releasing the accelerator to build up energy in your engine. Once you've exited the KERS area, you receive a boost of some form depending on how many times you pressed and released the accelerator (up to three times max). This is pretty useless, however, as the CPU seldom ever doesn't get the maximum amount of boost. KERS is a nice idea in concept, but it's nowhere near as satisfying as screeching around a corner at full speed. Speeding through the Italian countryside. Of course, a cartoony kart racer wouldn't be much fun without items to throw a wrench in a racer's plans to win. F1 Race Stars comes with a wide variety of items, but the majority of these simply are generic forms of what can be found in the Mario Kart series. For instance, the red item serves as a homing missile much like Mario Kart's red shell. Yellow items shoot forward or backward, bouncing off walls until it disappears or hits a player. Blue items create bubbles that rest on the track, temporarily putting anyone who touches them inside a bubble. There are some interesting ideas with the item. Okay, well one. The safety car item unleashes a car that stays in front of the first place racer, keeping their maximum speed lower than normal. the screen can really mess you over. Each time you are hit by an item, your race car becomes damaged. Each hit makes you car slower and slower. Thankfully, playing to the idea of the game being set in a colorful and whimsical version of the F1 series, there are usually two pit stops to ride through to instantly fix up your vehicle. Usually these pit stops make the player go out of the way a little bit, and since the tracks are so long, it can be quite a while until you are able to reach these sight for sore eyes spots. These signs indicate an upcoming pit stop. Tracks feature plenty of shortcuts to be found. However, the ones that pretty much break the game are the ones requiring a key to unlock a door somewhere on the track. The key is always in a place that is off the beaten path, but the subsequent locked door opens up and reveals a massive shortcut. This would be fine if it weren't for the key easily being picked up by the computer before you even get a chance to be close to it. The CPU will seemingly always get the key and always take the shortcut, easily separating itself from the rest of the pack. Then it's a game of catch-up for the rest of the race, and you'll be lucky if you ever see that computer racer again. However, what damns F1 Race Stars the most-- any version of the game, mind you, and not just the Wii U port-- is the game's immensely frustrating and severely uneven difficulty. 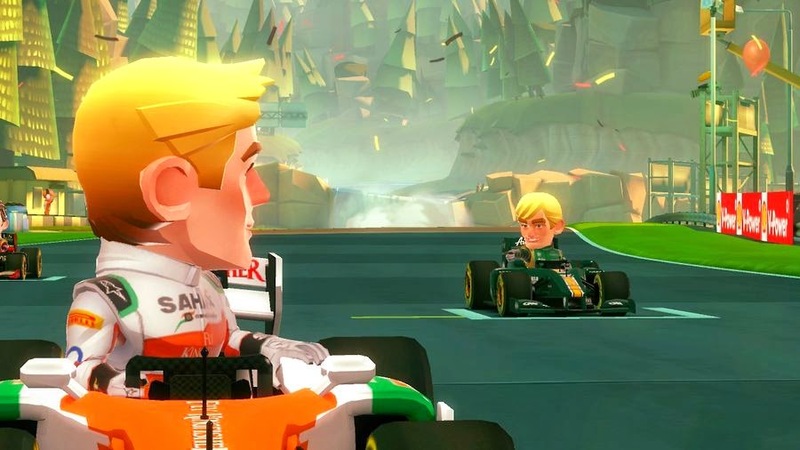 For a game that obviously is meant to appeal to children with its bright colors and cartoon visuals, F1 Race Stars uses its pleasant and welcoming visuals to mask its intense hatred for the player. What do I mean by this? Well, for one, it really feels like you have little control over whether you cross the finish line in first place or not. You can race with the exact same skill and ability in one race and end up first, while another the same parameters of skill are in place and you get sixth. It truly feels random whether you're going to win or not, and I don't mean in a Mario Kart item way either. Don't be surprised when you're in first place and suddenly two CPU drivers pass you, yet you don't even see them do so. 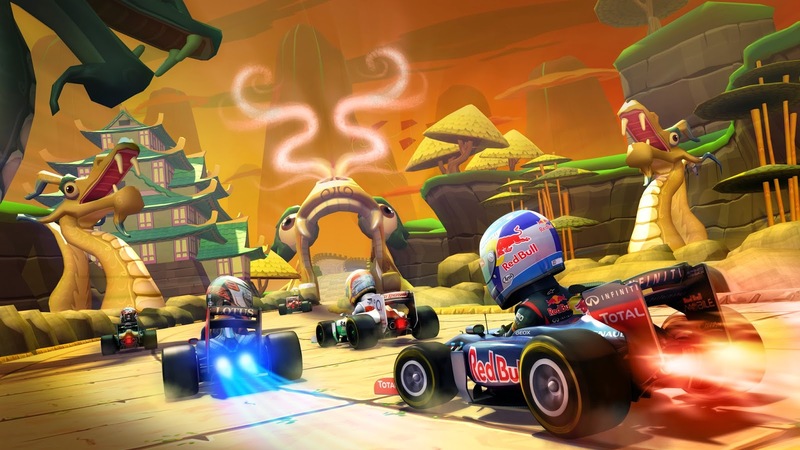 Throw in the "joy" of constantly being bombarded with the mostly stale items F1 Race Stars possesses, and you have an incredibly aggravating kart experience. Playing with friends and family locally (the Wii U version has no online for some stupid reason) sort of alleviates some of the burden, but F1 Race Stars is still a frustrating game all the same. 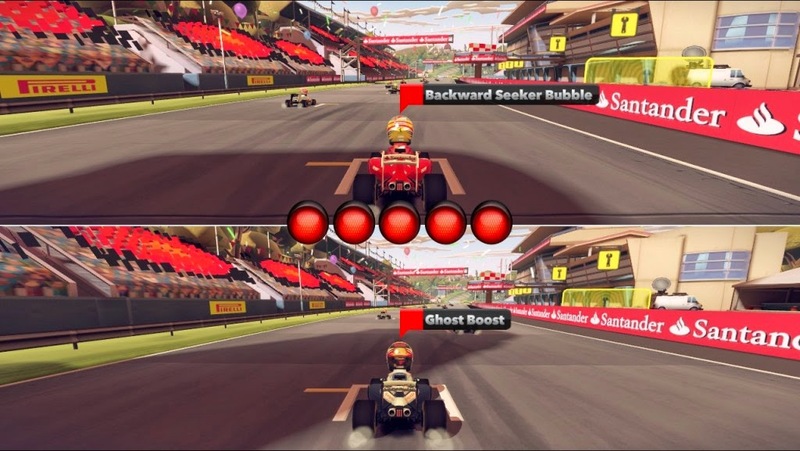 Up to four players can participate in the Career mode, which offers over 20 combinations of tracks to be raced one after the other, usually in groups of two to four. Since as stated there's only 15 tracks, there's a lot of repetition here, even when the developers throw in unique challenges like trying to keep your fuel gauge elevated by driving through gas tanks. It all adds up to a mode that feels like padding to make the game feel more complete than it actually is. I really wanted to like F1 Race Stars: Powered Up Edition, but the game ultimately did its best to tick me off and annoy me at every step of the way. When you don't feel like you have any control at all in the fate of winning or losing, you're probably playing a poor kart racer. The AI is cheap, the items are generic as all get out, and several design decisions leave me completely puzzled. F1 Race Stars: Powered Up Edition isn't worth the $30 asking price on the eShop. I would go so far as to say it's not worth it at half price either, unless you have masochistic tendencies, then go at it. 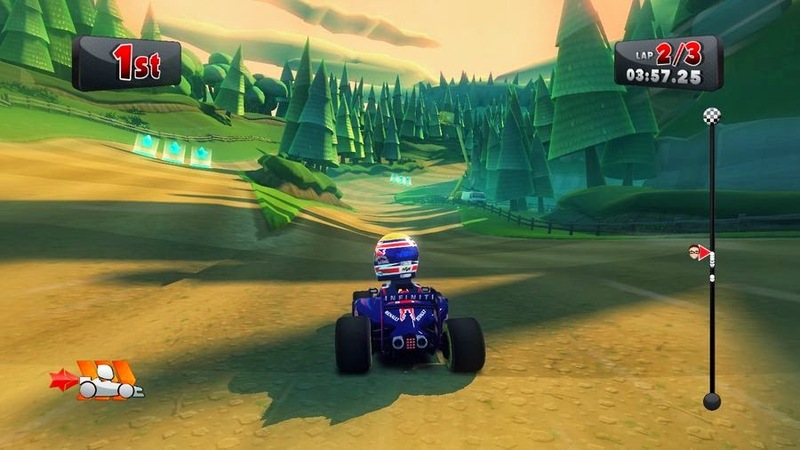 If F1 Race Stars: Powered Up Edition was participating in a race, the entire field would lap it. If you absolutely can't wait until Mario Kart 8 to release at the end of May, do yourself a favor and play Sonic & All-Stars Racing Transformed, and if you've already done that, do it again. It'd be a much better choice than this game. We all have them, boss battles that stay with us long after we've bested them and saved the day. Some argue that boss fights are antiquated, but we find them that when they are done right they can turn a good game into a great one. These are such encounters that have remained in our collective memory ever since we've defeated them. They can be challenging, they can be innovative, or they can just be plain old fun. Join us as we list the five new entries in our continuing Best Boss Battles in Gaming History series of features. After we're done, we'd love to hear your thoughts and recommendations. Next month, NES Remix 2 will be releasing on the Wii U eShop. With that in mind, why don't we take a look at the original compilation of Nintendo Entertainment System classics with NES Remix? Here's our review. When you are a games manufacturer that has been around as much as Nintendo, you're bound to have your share of critics. Nintendo is often chastised for relying on nostalgia to sell many of its games. While the Wii U eShop offering NES Remix does little to argue against that, it's a worthy addition to anyone's digital library, and a perfect download for retro gaming enthusiasts. With NES Remix, Nintendo has provided sixteen NES classics such as Super Mario Bros., The Legend of Zelda, Donkey Kong, Balloon Fight, Tennis, and Clu Clu Land, for instance. You start off with a select amount of games available to you (six to be exact), and as you progress you unlock new titles. However, these aren't full versions of these NES games. this is the good kind of poison. Instead, the developer Indiezero (past works include Retro Game Challenge and Theatrhythm Final Fantasy) and Nintendo have created WarioWare style mini-games that put you in various scenarios based off each game. These scenarios implement some gameplay mechanic within the games for a brief mini-game of sorts. 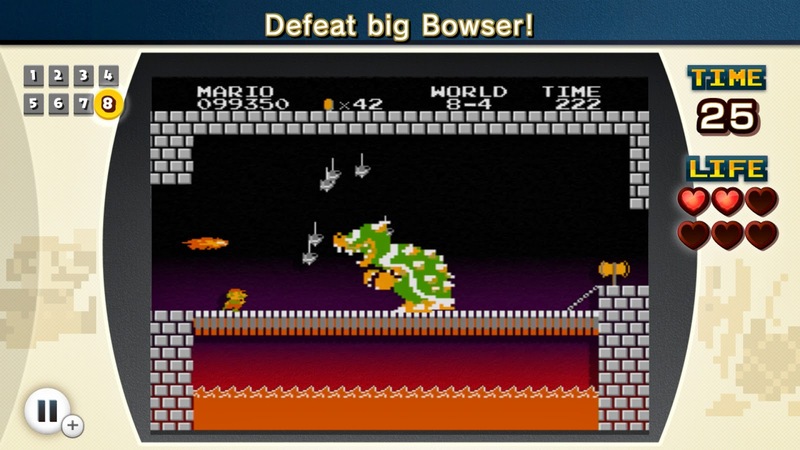 For instance, in Super Mario Bros. one objective is to hit the block containing a beanstalk, another is to collect a specific amount of coins, or cut the drawbridge to eliminate Bowser. Each challenge puts one of your retro gaming skills through the wringer and then some. Of course, not all of the challenges are winners. There are some duds here and there. No one ever said you had to ride a fair race. These quick burst levels last anywhere between 5-60 seconds. Some of which contain multiple parts to them. 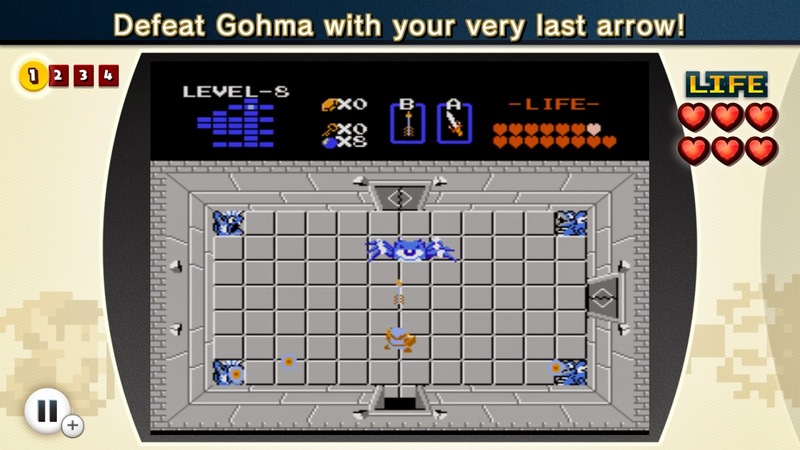 A fun element of NES Remix is that each mini-game is timed. The better you do, the more stars you earn, the grading system of NES Remix. You can earn up to three stars, and if you're really good you can get a rainbow outline surrounding each star. Stars are the metric by which other NES classics are unlocked. It takes being fast, efficient, careful, and skillful to acquire the greatest of ratings. Times can be shared with friends, so there's an asynchronous level of competition to be had. Each challenge bestows you with three lives to complete it. Losing all three lives with allow you to retry the challenge at the part of it you failed (pending it has more than one part), but you won't be able to receive the coveted three star rating. 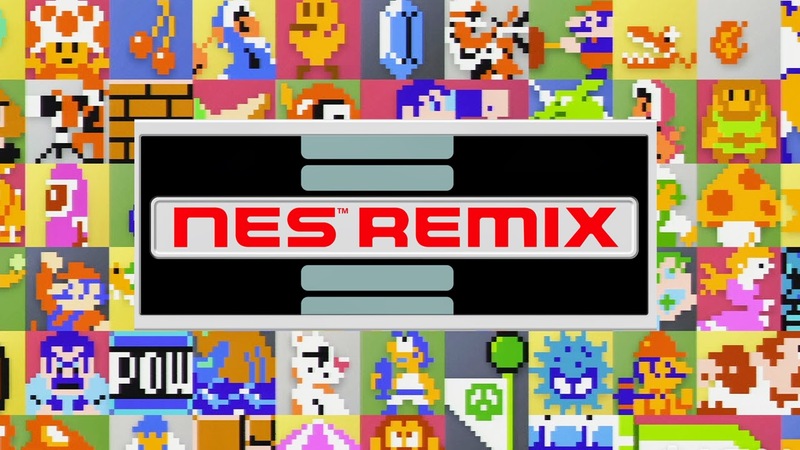 By far the most impressive piece to NES Remix are the remix levels. These levels offer a fresh perspective to the various NES games featured in this collection. One remixed level has you on an Excitebike track, being required to drive in a pitch black arena. Your only source of light comes from your bike's headlights. Then there's a level where you're playing as Luigi who is forced to continually run. Your only option is to hit the jump button at appropriate times to avoid pits, enemies, and other hazards. Remix levels get even more interesting and off-the-wall when you reach the ultimate challenge, the Bonus remix stages. Such challenges from these levels include attempting to score 15,000 points with a disappearing ball in Pinball, doing tasks within the second quest's Hyrule in The Legend of Zelda, and popping every balloon while in slow motion in Balloon Fight. splash they make in a pool of lava! In addition to stars, there is another thing to collect from these mini-games. Each time a level is completed, you receive an amount of bits. The first time always yields the most bits. As the gauge goes up through gaining bits, you earn new Miiverse stamps based on 8-bit art from the various NES games each time the gauge fills up to its maximum level. 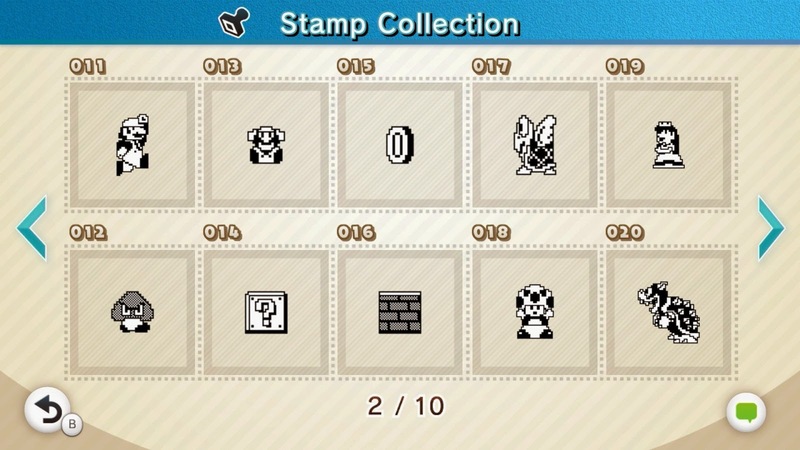 There's already been some very clever Miiverse posts done by various players using these stamps. 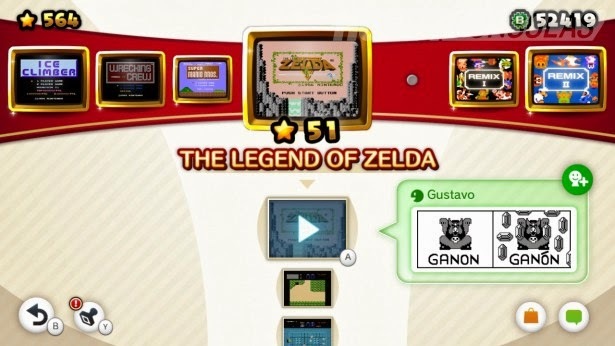 Become a virtual philatelist with NES Remix. You need to have an appreciation for the NES era and retro games in general to fully enjoy NES Remix. Even then, however, some of the games featured in this title just aren't really that much fun and possibly were never fun to begin with. It's great that the games play the same as they did way back when, but dealing with frustrations in Golf and Ice Climber because of how antiquated the controls and/or gameplay are brings NES Remix down in quality a little. Some games have aged better than others. If you're worried about how much gaming you can find within the bite-size challenges NES Remix offers, don't be. In order to complete every challenge, unlock every game, and earn every reward there is, NES Remix can take upwards of 20 hours to finish. That's obviously only if you're able to deal with how retro these games truly feel. 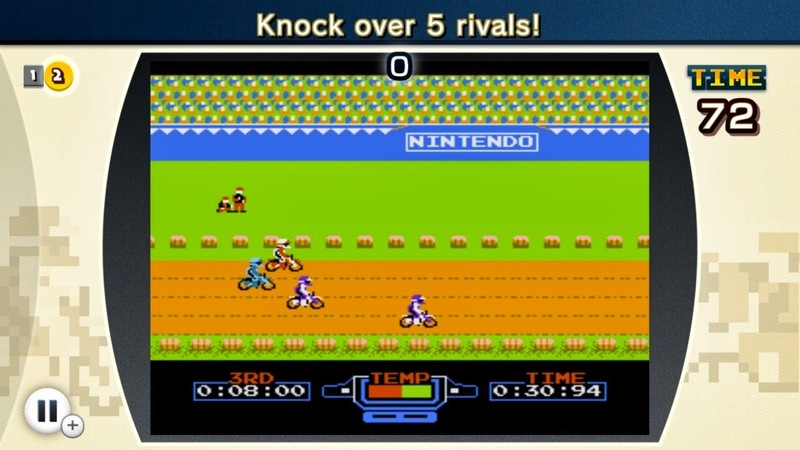 While there is a lack of traditional multiplayer, it is quite entertaining to pass the controller around between friends, giving each player a turn to beat a given level of NES Remix. NES Remix may play more to those who are nostalgic for or simply enjoy classic NES gaming, but it's certainly not limited to that demographic. 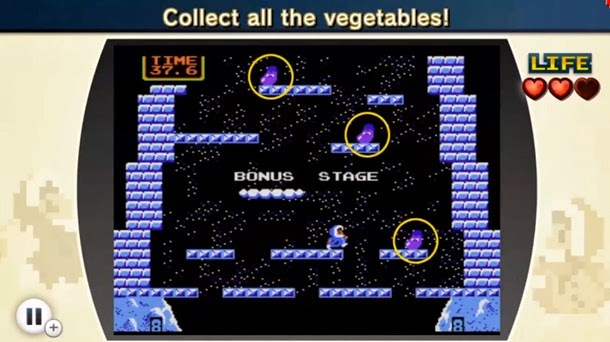 NES Remix slowly introduces gameplay concepts of each of its sixteen titles, meaning Nintendo could essentially be giving a whole new generation an appreciation of these historic titles (okay, Ice Climber is hardly historic). 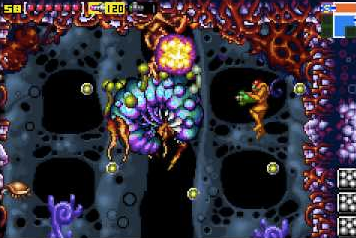 The arcade-like challenges, the time-based scoring, and the unique twists presented by the remixed stages mean that players will be investing some serious time if they wish to do so. While not all games and challenges are as successful as the last, NES Remix delivers a healthy heaping of retro gaming goodness.